"One would think this had been written by a doctor." In order to obtain Justina's cure a friend of the family had arranged for a triduum in honour of the Sacred Heart in the Church of S. Giovanni. All the household took part in it. But Gemma- she whose heart was burning to be near Jesus- remained with the sick woman, and recited with her the prayers that were being said in the church. 'Father, the mother is very seriously ill. I have been thinking this way: when I was sick she was ready to help me even more than she was able, but I have had no opportunity of showing them gratitude. Perhaps the time has come? The mother is sick and I cannot make any return for all she has done for me. Up to the present I have offered for her only a little suffering, some little mortifications. . . . This morning I spoke to Jesus, and afterwards I said to my confessor: "I should like to give my life for the poor mother!" "No. Absolutely no." I then said: "Two years, at least? May I not give at least that much!" Jesus was satisfied, and [throuugh the confessor said: "Yes, you may. However, on condition that the Father director is also satisfied!" Serafina was a friend of Gemma who had mentioned her to her spiritual director before. 'I have only about eight years to live,' she wrote to him. 'I should like to give three to Serafina and keep the others for myself.' After several refusals and many evasions, Gemma persisted and at length she eventually obtained the desired consent. Signora Justina was cured except for an inconvenience of another nature which Gemma herself had foretold. Gemma, however, became seriously ill with stomach trouble, and was in violent pain. It seems that she literally took upon herself the pains of Justina's illness. Aunt Cecilia realized how much she was suffering because Gemma said that the effect of 'swallowing a drop of water was like a burning fire in her stomach'. Father Germanus attests that both of the women mentioned above got better, but that Gemma died at the exact end of the period she had bargained to live. In the letter to Father Germanus she wrote "I have only about 8 years to live", and Gemma was 22 years old when she was given the permission to make the offering of 'three years for Serafina, and two years for Justina' and the fact remains that Gemma died exactly three years later, at age 25. Here is another rare and sublime act of heroism on the part of Gemma. When Gemma used to go to the Convent of the ‘Mantellate' Nuns, she heard that one of the religious nuns frequently suffered greatly from terrible attacks of the Devil. What was she to do to help her? Gemma was not one to measure the extent of her generosity, or to hesitate at obstacles. She immediately decided to offer to take upon herself these diabolical attacks in order that the nun might be thereby released from suffering. Besides, she would have liked to undergo this kind of suffering on behalf of sinners. Having obtained Monsignor Volpi's permission, she asked Jesus to make the exchange. The nun was freed and Gemma was submitted to this new and awful suffering. There must have been many poor sinners who reaped spiritual profit from this extraordinary act of charity! In fact throughout her life Gemma had long worked, suffered and prayed for the salvation of sinners when a few years before her death Jesus decided, as it were, to invest her solemnly with this mission of converting souls, and thereby consecrating her as an acceptable victim to His most Sacred Heart. Thus Gemma became a victim soul suffering in union with Jesus for the conversion of sinners. In fact, only two days before her death, she obtained one of her many conversions. It was her last. She had prayed long and earnestly for this man who was well known for his sinful actions. During her last illness she said: 'I shall bear him on my shoulders, all this Lent, but then I shall leave him alone.' And indeed she did leave him alone on Holy Thursday, the day he was touched with sorrow for his sins and returned to God by a humble confession, to the great surprise of all who knew him. 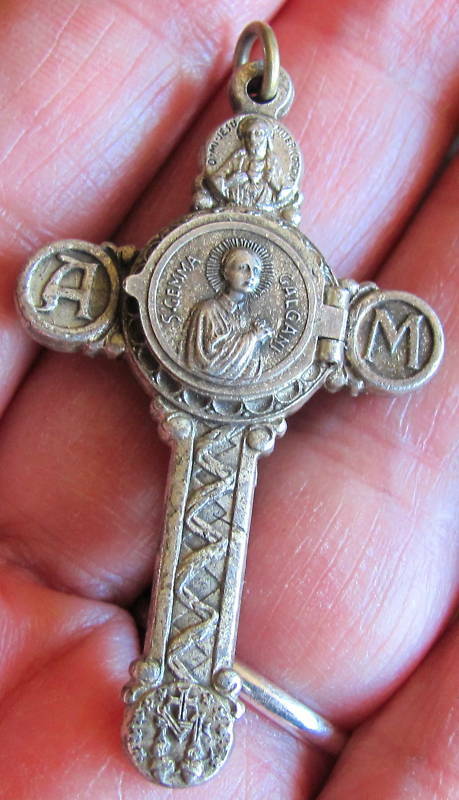 And having brought this last sinner back to God, Gemma died two days later- on Holy Saturday, as the bells of the Easter Vigil where beginning to ring. “In order to be able to help her neighbour, Gemma was willing to go hungry. She would have liked to give away everything. On the contrary I did not approve of this and I scolded her because, I said, I did not want to encourage the poor to come to the house in a procession. Besides, in case of any trouble I should not have been able to help Gemma. At table she usually put aside something for the poor, and then when there was a knock at the door, she would ask my permission to give it away. I used to answer: "Yes, but you must not bring them into the house." Gemma used to give the poor short instructions in the Catechism, hoping thereby to raise their thoughts to Heaven and thus make the sorrows of life more tolerable. Aunt Cecilia declared that Gemma often urged her to visit certain sick people who otherwise would never have been visited, and for this purpose put forward such arguments that she was obliged to yield, and Mother Gemma Giannini attests that it can truly be said that all her aunt's (Cecilia's) charities were inspired by Gemma. In fact Gemma had to be closely watched, for she would have given away everything that belonged to her, although she was scrupulous in her care of the goods of the house. She had not much to give, however. Her furniture consisted of a rough chest of drawers in which she kept her linen, and a little table. Every month her aunt at Camaiore sent her five or six lire, but her various charities claimed this money immediately. When she first came to the Gianninis' she had about thirty lire which she had given to Palmira Valentini for safe keeping. A certain person in need asked for it, and Gemma would have given it away at once, only she was accustomed to ask permission in such circumstances from Aunt Cecilia. However, both Aunt Cecilia and her confessor Monsignor Volpi opposed this, and the former kept the money for the use of Gemma and her family. 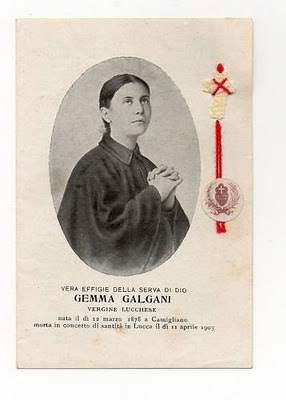 -Source for this article is the excellent book "Blessed Gemma Galgani" by Padre Amedeo, C.P., 1935. “How good Jesus always is! I desire never to leave Jesus. I want to offer Him all that I have. I want to offer Him all of myself. But what do I possess? Nothing but my sins, my miseries and my great self-love. And this is the gift that I make to Jesus. But, He will have compassion on my misery. I fall and fall again, but Jesus is with me. He will give me strength. He will give me grace. Thy mercy, oh Lord, is the foundation of all my hopes. I know that the mercy of God is greater than my ingratitude.” –Words of St Gemma Galgani.